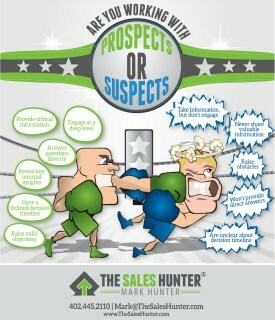 Are You Working with Prospects or Suspects? Do you know if you are working with true prospects? Or are they really just suspects? This free infographic gives you clear signals on how to tell the difference between someone who could be a great customer and someone who is just wasting your time (or worse, grabbing your price so they can shop around with your competitors). To be successful in sales, you must know the difference.